Firefox is already a really comfortable choice when it comes to searching the web. While the search box is no longer displayed by default, it is still possible to bring it back to run searches using it. While you can use the address bar of the browser to run searches as well, the search bar offers greater flexibility when it comes to searches. Did you know that there is another way, even faster and better than this one? Firefox supports so called keyword searches which speed up the search process when you want to run searches using a search engine that is not the default. A keyword is a user-selected variable that is linked to a search engine in Firefox. You may use the keyword to run searches on the linked search engine by typing the keyword followed by the search term in Firefox's address bar; handy as you don't need to visit the search engine first or select it as the search engine in Firefox's address bar or search bar. You may right-click any form field in Firefox and select the menu entry Add a Keyword for this search to create a new keyword powered search in the browser. Selecting this opens a new add Bookmark menu which asks for a name and a keyword. Tip: check out our general overview of keyword search functionality in web browsers. Go to duckduckgo.com and wait until the site has fully loaded. Right-click the search form on the page and select the add a keyword for this search option from the context menu. Use the suggested name or change it, and add a keyword to it as well, e.g. dgg. 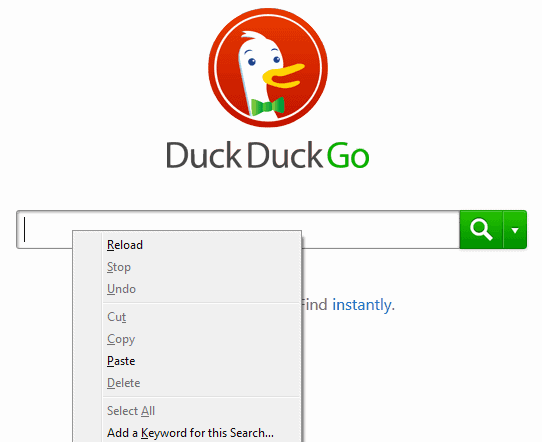 When I want to search on DuckDuckGo now, I only have to enter ddg "phrase" into Firefox's address bar, e.g. ddg firefox to run a search for firefox. The same method works for other websites including, Google, Yahoo, IMDB, Deviantart, Startpage, Bing, or Slashdot. Firefox used to come with a set of default keywords for search engines but that is no longer the case. Load about:preferences#search in the browser's address bar. Scroll down to the One-Click Search Engines listing. Double-click on the keyword column of the search engine that you want to assign a keyword to or edit an existing one. Type the keyword (one or multiple characters). There is another possibility to add keywords in the browser. Any bookmark has a keyword field associated with it that is normally empty. By assigning a keyword to a bookmark you can use that keyword to open the url. If you use gH for Ghacks for instance it would open my site if you would type in gH into the address bar. Pretty nice for sites that you do visit a lot as it can speed up the process for you; ideal if you clear the browsing history regularly or want to access specific pages (as Firefox may display site results in the list of suggestions). Last but not least you can add wildcards to urls as well. If you edit a bookmark you see that it asks for a location and a keyword. The location is normally the url of the website and the keyword the shortcut key. A wildcard would be added to the location to further customize a search or visit a special part of a website. The wildcard symbol is "%s" which means that a valid location would be for instance http://%s.google.com/. If g would be assigned as the keyword you are able to access Google websites such as adsense (adsense.google.com) or video (video.google.com) by entering g video in the address bar of the browser. You can use keywords to search on different search engines in Firefox directly from the browser's address bar. Keywords enable you to load websites that you map to them right from the address bar without having to enter the full address. Wildcards are supported so that you can easily access subdomains or directories on websites. Firefox's keyword feature is a mighty tool that can improve web search and how you access websites significantly. While it may take a minute or two to setup, and some time to get accustomed to the new options, it is well worth it in the end. 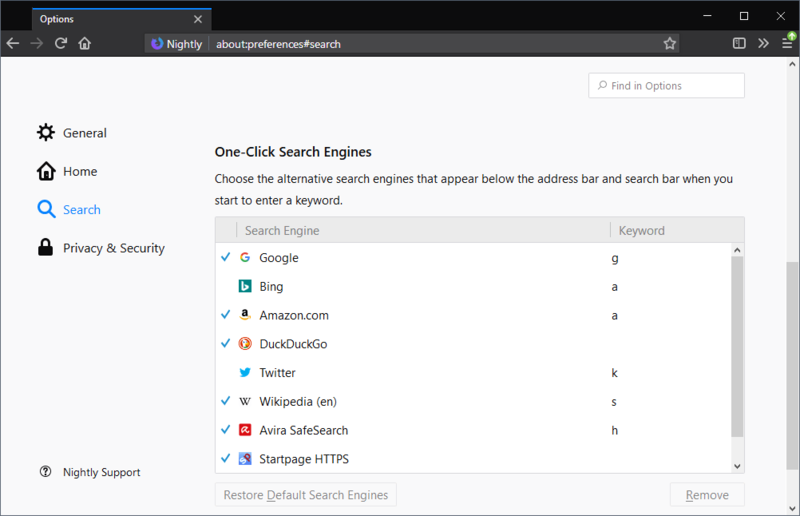 Firefox supports so called keyword searches which speed up the search process when you want to run searches using a search engine that is not the default.